Garlic has long been used in traditional medicine due to its powerful medicinal benefits. It has been all around the world to treat various conditions right from hypertension and infections to snake bites. Even though the thought of garlic makes us cringe, a lot of herbalists and natural healers have been prescribing it for its health benefits. The potent smell of this popular kitchen herb is what makes it a strict no-no in a diet. However, the fact that this herb is loaded with numerous vitamins, minerals, and antioxidants, making it a must to include herbs in the diet. Garlic Benefits: Is It Good For The Health? It also contains traces of other essential minerals and nutrients like selenium, zinc, copper, Vitamin B1, Vitamin B2, Vitamin B5, and polyunsaturated fatty acids and monounsaturated fatty acids. With a good amount of protein and fiber and low quantity of fats, it is also low in calories and high in nutrient content, which makes garlic an essential herb for overall health. 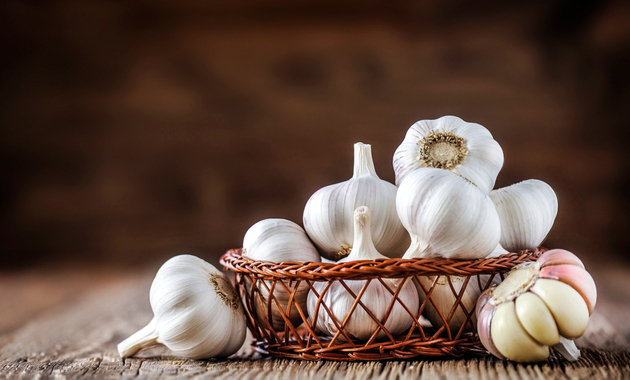 Visit Our Ayurveda Page To Read More On Garlic And Its Medicinal Properties. While we all know that garlic has a lot of health benefits in general, here is why it can prove out to be quite an effective natural remedy for the heart. Benefits of garlic range from improved immunity to reduction of bad cholesterol. Scientific studies have shown how this herb can be a healthy resource for improving your heart health. Here are the top five reasons why is garlic good for the heart. Research has shown that consumption of garlic is bound to prevent moderately high blood pressure which can, in turn, protect against a heart condition. Blood pressure lowering properties of this herb appear to come from the bulb portion of the plant and have been attributed to sulfur-containing compounds. Allicin, the active ingredient in garlic, is thought to be one of the main compounds responsible for regulating blood pressure and keeping the heart healthy. Cardioprotective effects of dietary garlic are mediated in large part via the generation of hydrogen sulfide (H2S). Garlic-derived organic polysulfides are converted by red blood cells into hydrogen sulfide which relaxes vascular smooth muscle, induces vasodilation (widening) of blood vessels, and significantly reduces blood pressure. Studies have shown that supplementation of this herb reduced blood pressure by 7-16 mm Hg (systolic) and 5-9 mm Hg (diastolic). Is Your Blood Pressure In Control..?? Get It Checked. Click Here. Platelets are the blood cells that help in blood clotting. If these blood cells aggregate they can thicken the blood and make it difficult for the heart to pump out blood in a smooth manner. Hence, including garlic in diet can help in preventing platelet aggregation and improving blood flow to the heart and other organs of the body. This, in turn, can lower the risk of heart conditions such as heart attack or problems caused due to poor blood circulation. It also increases fibrinolysis, which is a process that dissolves fibrins in the body that in turn helps in the prevention of unhealthy blood clots. It helps in the facilitation of fibrinolysis in a smooth manner thereby avoiding heart-related health problems. High cholesterol level is one of the key risk factors for heart disease. According to a 2016 study published in the Journal of Nutrition, garlic supplementation reduced total cholesterol by 7.4-29.8 mg/dL. This proves that this herb acts as an effective natural remedy to control hypercholesterolemia. It is known to improve good cholesterol (HDL or high-density lipoprotein) in the blood and lower bad cholesterol (LDL or low-density lipoprotein) in the blood, thus maintaining healthy cholesterol level in the body. The presence of sulfur compounds in garlic is known to improve blood circulation and prevent accumulation of cholesterol in the bloodstream. Moreover, it also lowers the production of LDL cholesterol by the liver. Garlic is also packed with antioxidants which are known to flush harmful toxins and free radicals from the body. These compounds not only increase the risk of inflammation but also affect the blood vessels, which in turn can increase the risk of heart disease. Hence, it is advised to include garlic in the diet as it not only improves blood flow but also prevents accumulation of toxins in the blood vessels thereby helping you to maintain heart health. Atherosclerosis is a condition which causes hardening of the arteries, blood vessels that supply blood to the heart, thereby increasing the risk of heart disease. Intake of garlic has also proven to improve blood circulation that is otherwise prevented by hardening of the arteries (atherosclerosis). It helps in preventing the buildup of cholesterol, fats and other such substances in the arteries which in turn can provide protection against atherosclerosis and coronary heart disease. Garlic is a definite home remedy that helps in preventing heart problems or cardiovascular health issues. It can be consumed on a daily basis without second-guessing its side effects. However, there are few things to keep in mind before you use garlic for the heart. This herb is very healthy and imparts a unique taste and flavor to your diet. You can include it in curries, soups, and dips or use it for dressing. To attain the best qualities and benefits of garlic, it is suggested that you consume it in its raw form. This is because sulfur compounds, which as an active ingredient of garlic, are formed when it is crushed, chopped or chewed. Cooking this herb can reduce the efficacy of these compounds. If you are somebody who cringes at the thought of smelly garlic then you can slightly roast it in a pan and take it as it mitigates its strong smell. You can also consume this herb in the form of its supplements. But before you opt for these supplements, do talk to your doctor. If you are taking blood thinners or suffer from a bleeding disorder, then it is advised to consult your doctor before taking garlic supplements or increasing the intake of this herb in your diet as it can lead to health complications. Heart Disease In Women: 10 Things To Know About! 1. Longvah, R. Ananthan, K. Bhaskarachary, K. Venkaiah. Indian Food Composition Tables 2017. National Institute of Nutrition. Indian Council of Medical Research. 2. Ravi Varshney, Matthew J Budoff, Garlic and Heart Disease, The Journal of Nutrition, Volume 146, Issue 2, February 2016, Pages 416S–421S. 3. Ried K, Travica N, Sali A. The effect of aged garlic extract on blood pressure and other cardiovascular risk factors in uncontrolled hypertensives: the AGE at Heart trial. Integr Blood Press Control. 2016 Jan 27;9:9-21. 4. Ginter E, Simko V. Garlic (Allium sativum L.) and cardiovascular diseases. Bratisl Lek Listy. 2010;111(8):452-6. 5. Alali FQ, El-Elimat T, Khalid L, Hudaib R, Al-Shehabi TS, Eid AH. Garlic for Cardiovascular Disease: Prevention or Treatment? Curr Pharm Des. 2017;23(7):1028-1041. Brown Eggs Vs White Eggs: What Is Better For You?